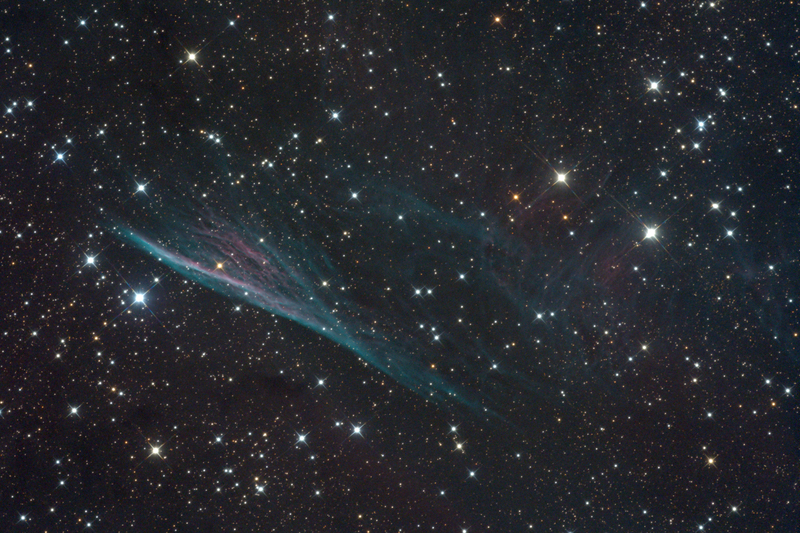 The Pencil Nebula visible in the image is a small part of the famous supernova remnant called Vela SNR, in the constellation of Vela. The 815 light-years away Pencil Nebula, identified as NGC 2736 was discovered by John Herschel, son of William Herschel in the March of 1835 during his voyage to South Africa. The goal of his expedition was to catalogue southern stars and nebulae, continuing the work started by his father. He installed a 6.4m telescope for the work. In this case 6.4m means the focal length of the telescope, because in those times focal length was thought the most important parameter of a telescope. With that telescope John Herschel could see only the brightest parts of the Pencil Nebula, the giant supernova remnant which the Pencil Nebula is only a small part of was not discovered by him. Actually advanced astro-imaging technology is needed to make the remnant visible. The Vela Supernova Remnant (shortened as Vela SNR), as its name suggests, was formed during supernova explosion of a heavy star. Approaching the end of their lives, heavy stars eject great amount of material in their close environment. As the ejected material expands, it gets thinner and cooler. When the star finally becomes a supernova it emits a high-energy shock wave which expands much faster than the material ejected before, the shock wave approaches and sweeps through the material. During this process gases around the star get dense and hot. Temperature in those gases can reach several million Kelvin making them ionised. As the temperature starts dropping, excess energy is radiated into the space as photons. These photons are making the remnant glow. According to our current understanding the supernova explosion which formed the Pencil Nebula happened about 11-12.000 years ago, 800 light-years away from our Solar System. During the explosion the brightness of the star became 250 times brighter than Venus, making the star easily visible during daytime too. All the atoms heavier than hydrogen in the Universe was created in stars by nuclear fusion. These atoms were spread in space by processes similar to the one described above, to became the source of newly born stars, stellar systems, planets, moons. Our Solar System, including Earth, is also formed of material created in ancient stars. Plenty of oxygen can be detected in Vela SNR which implies that it was created by a type II supernova. The core of this kind of supernovae used to become a neutron star or black hole. Actually there is a fast spinning neutron star in the region: The Vela Pulsar, which is unfortunately located outside of the FOV of this photo. Pulsars are fast rotating neutron stars with strong magnetic fields, emitting intense electromagnetic radiation in a narrow beam aligned with the stars' magnetic poles, similarly to the light-houses on Earth. When the beam's direction points towards us during its rotation we see the star's brightness pulsating. The high rotation speed of neutron stars is the result of the law of conservation of angular momentum: When the progenitor star's core collapses its diameter becomes much smaller than before (only 10-15 km) to maintain the angular momentum its angular velocity has to increase. Vela Pulsar for example makes more than 11 rotation in a second. Unfortunately the relation between Vela Pulsar and Vela SNR is not fully proven. Some data seems to contradict: the pulsar is not exactly in the centre of gravity of the SNR, it is off by about 1.5 degrees. Also the speed of the pulsar is different to the speed of the remnant. Interestingly, there is another supernova-remnant behind Vela-SNR, the Puppis Supernova Remnant, which is more then 4 times farther than the Vela SNR.